Since Valentine's Day is coming up, I know a lot of you will be making Valentine's Day cards. 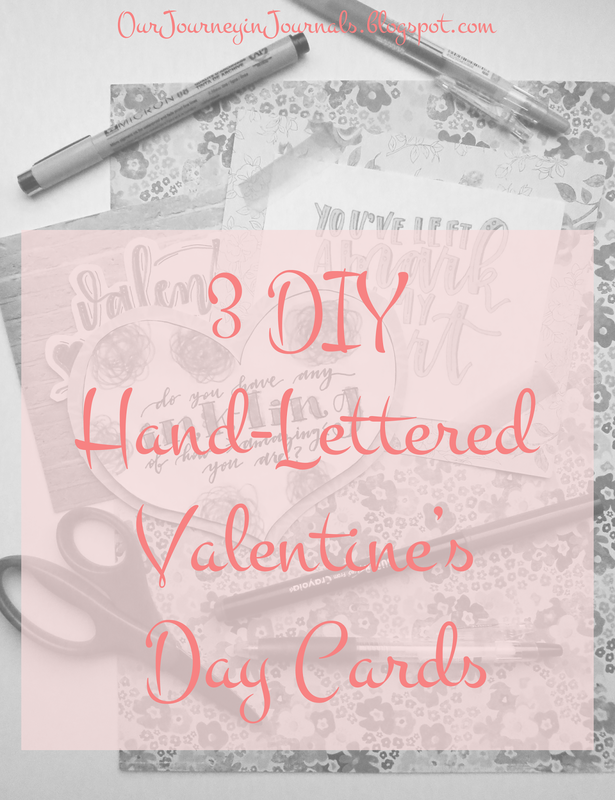 So, because of this, I decided to come up with three original ideas for hand-lettered cards that you can make yourself (if you are able to do calligraphy, that is). As a special bonus, they all feature stationery puns! 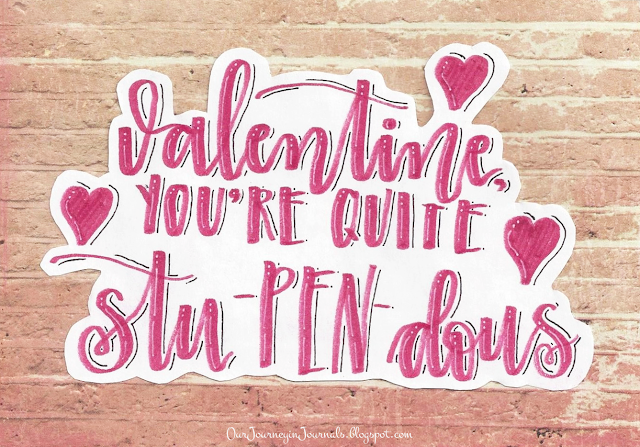 Even though I don't really like Valentine's Day because it's always overrated for this perpetually single girl, I thought that having stationery puns would make it a lot more fun. All of these cards were done on random (cheap) printer paper. Because of this winter weather, I've been forced to use artificial lighting instead of natural lighting for the past couple of months, so the color balance and stuff of my pictures have been FAR below where I would like them to be. Thus, for this post, I scanned all of the cards to my computer. What do you think of the quality of the scanning? This one says "Valentine, you're quite stu-PEN-dous." To make it, I used a Crayola Super Tip marker to do the main letters, a white Sakura Gelly Roll Classic for the highlights, and a black Pilot Juice 0.5 Gel Pen to do the shadow things. I practiced the layout of this a couple of times before I settled on one that I was mostly satisfied with, and then I added those (admittedly somewhat sad-looking) hearts to fill up some of the empty space. Next, I cut the entire thing out and taped it to scrapbook paper simply by folding normal Scotch tape into a loop sort of thing to make it double-sided; you probably know what I'm talking about. I would've preferred to glue it rather than tape it, but I find taping to be a lot easier and quicker to do. 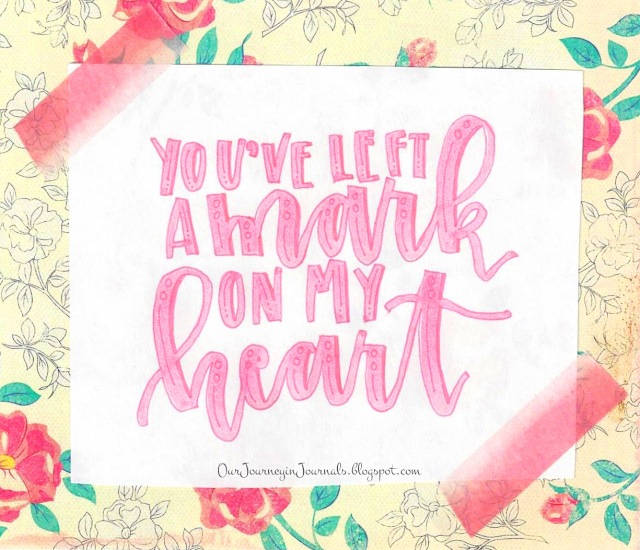 The second card says "you've left a mark on my heart." Like marker - you get it? Ha ha ha . . . Anyway, this one was also done with a Crayola Super Tip. Seriously, I love those markers so much. 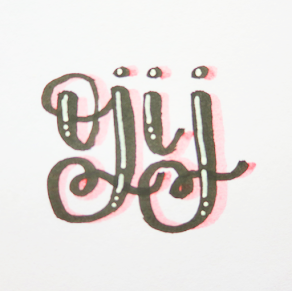 I outlined each letter using a baby pink Pilot Juice 0.5 Gel Pen, and I thickened the downstrokes of the outline. I also added those little ornamental things on the downstrokes just to add a bit of decoration to the otherwise mostly plain looking calligraphy. After doing the actual hand-lettering itself, I cut the artwork out and taped it to a piece of scrapbook paper using the DIY double-sided tape again. For two corners of the paper, I used pink washi tape that matches the pink marker pretty much only because I thought it looked pretty that way, and I used Scotch tape on the back of the other two corners. 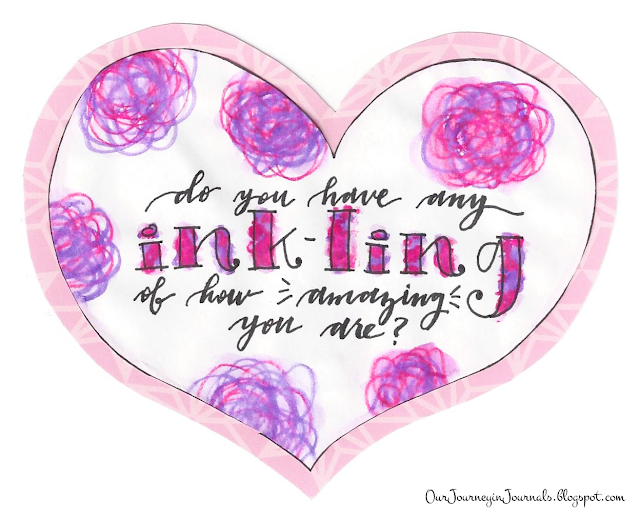 The third and final Valentine's Day card I created says "do you have any ink-ling of how amazing you are?" I think that this, out of the three, is the most difficult to create. For this one, I used a Sakura Pigma Micron in the 08 size to make the outline of the "ink-ling" and the cursive of the rest of the card. I also used a Micron in 03 to thicken the downstrokes of the words in cursive. For the purple and pink of this card, I used a Crayola Super Tip marker and a Crayola Broad Line marker, respectively. To do the inky-ish effect in "ink-ling", I literally just made kind of circular scribbles in the different colors in random places of the space, and I intentionally colored outside of the lines a couple of times to give it the certain look that I was aiming for. I then used a water brush to make it actually look like it was painted on with ink (and not scribbled on with marker). For the rose-ish things, I made the kind of circular scribbles with the two markers again, but larger this time. And like before, I used a water brush to make them look more like ink. Next, I used the 08 Micron to draw out the outline of a heart. I tried to add some color to the edges by picking up marker ink with the water brush, but I failed quite badly. Anyway, after this, I cut the heart out, taped the back of it to a piece of scrapbook paper, and then finally cut a larger heart out of the scrapbook paper. For all of these calligraphy Valentine's day cards, I used scrapbook paper as a backing, and the back of the scrapbook paper itself is white. This means that I have space to write out who it's from, who it's to, or a small message to whomever I'm giving the card to. So those were 3 ideas for DIY hand-lettered Valentine's Day cards, all featuring stationery puns! I hope you found this post helpful, and most of all, I hope you groaned at these terrible puns as much as I laughed at them. Are you making or doing anything special for Valentine's Day? Let me know by leaving a comment down below!